Pull Ups or Chin Ups: Which is the Superior Exercise? If you were to ask any personal trainer or fitness fanatic their opinion on the best exercises to include in a strength building routine, chin ups and pull ups are routinely included. This is because these two exercises by themselves alone cover every muscle group in the upper body, making them great exercises to develop this area. While these two exercises are similar, it is important to know that they are not identical, as opposed to popular belief. These two types of exercises should be ones that you become familiar with, and knowing the difference between the two is a great place to start. What Are the Main Differences Between Pull Ups and Chin Ups? The first major difference between these two exercises that you should immediately notice is the position and placement of the hands. During a pull up the hands should be positioned slightly wider than shoulder width, and with the hands in a supinated position. Conversely you should take note that chin ups are done with the hands in a pronated position, or the palms facing in. Second, the movement of the exercises themselves is different. Both exercises primarily target the latissimus dorsi, or the large flat muscles of the back. The main difference here revolves around the shoulder, and whether the exercise involves its adduction or extension. Adduction of the shoulder leads to pull ups, and extension gives us the chin up. They are similar in this regard yet there are distinct differences between the two. What you need to keep in mind here is that both of these exercises are designed to primarily target the back, with the arms and shoulders being secondary. This means that if your goal is to develop your back as best as you can, pull ups nor chin ups should be your predominant exercise. Make sure to do an adequate amount of both of these exercises to develop the best strength and to avoid asymmetry. Why Can You Do More Chin Ups Than Pull Ups? The reason why most people struggle more with pull ups than chin ups no matter their fitness level, has to do with the mechanics of the exercise. When we are performing chin ups, we have more muscle groups pulling together in one direction, which makes the movement easier. In this case, the biceps are doing a large portion of the work along with the back. Pull ups on the other hand are recruiting less muscle fibers from the arms to get the job done, putting more of the load on the back and shoulders. This in turn makes the pull up the more difficult exercise for the vast majority of people. Which Muscles Do Pull Ups Target? What About Chin Ups? Both of these exercises should be hitting your back primarily, with your biceps secondary. You should feel your shoulders and forearms working a bit too, however again you should be pulling mainly with your back. As mentioned prior, due to the differences in the mechanics of the exercise, the chin up is going to work the biceps more so than a pull up would. On the other hand pull ups will put more of the work on the lats, making the workout more geared towards the back. Another factor here which is going to impact the results you get is the width of your grip. A good rule of thumb here is that the wider your grip is, the more you are engaging your back. Conversely the narrower your grip is, the more you are relying on your biceps to get the job done. A slight variation in grip positioning can really make that much of a difference as far as the difficulty of the exercise is concerned. If you are struggling with these exercises, try narrowing your grip as it typically decreases their difficulty. Are Chin Ups or Pull Ups Safer? The safety of these exercises really comes down to the user, as there is so much variation you can add to these exercises. The simpler the exercise, the less chance you have of injuring yourself so if you are new to chin ups or pull ups, keep it simple. As you become acclimated to the exercise you can start making modifications such as grip, hand positioning and other factors which can increase the difficulty of the exercise. Another thing to keep in mind here is that you always want to be performing these exercises with the bar in front of your face. You shouldn’t be doing anything that involves the bar being at the back of your neck, which is an easy and excellent way to cause neck injury. You should always keep in mind that wider pull ups aren’t always better either, no matter how many times someone tries to say wider pull ups means wider lats. You need to know that the wider your grip is, the more you are putting strain on the shoulder, while reducing your range of motion. The point here is that going wider isn’t always better for your joints or your development, so listen to your body. Which Exercise is the Best? Ultimately it comes down to what you want to get out of your exercise. 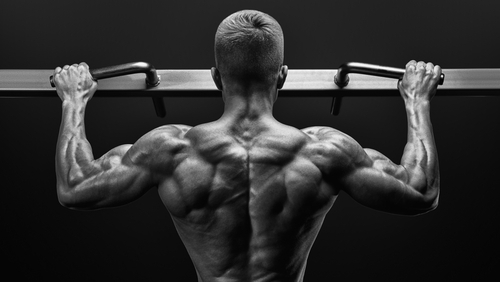 Pull ups are going to hit your back harder than chin ups would, so if you’re looking to develop your back quickly pull ups are probably the way to go. Remember that switching things up to doing chin up or altering your grip can make all the difference in improving your gains, doing the same movements over and over again produce stagnant results.